Malaysian Individual Investors: What Are the Factors That Influence Their Financial Statement Usage? 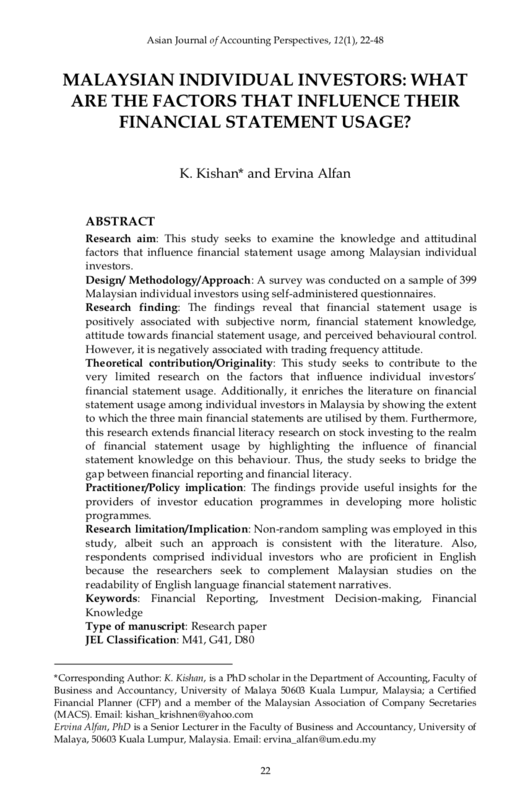 Research aim: This study seeks to examine the knowledge and attitudinal factors that influence financial statement usage among Malaysian individual investors. Design/ Methodology/Approach: A survey was conducted on a sample of 399 Malaysian individual investors using self-administered questionnaires. Research finding: The findings reveal that financial statement usage is positively associated with subjective norm, financial statement knowledge, attitude towards financial statement usage, and perceived behavioural control. However, it is negatively associated with trading frequency attitude. Theoretical contribution/Originality: This study seeks to contribute to the very limited research on the factors that influence individual investors’ financial statement usage. Additionally, it enriches the literature on financial statement usage among individual investors in Malaysia by showing the extent to which the three main financial statements are utilised by them. Furthermore, this research extends financial literacy research on stock investing to the realm of financial statement usage by highlighting the influence of financial statement knowledge on this behaviour. Thus, the study seeks to bridge the gap between financial reporting and financial literacy. Practitioner/Policy implication: The findings provide useful insights for the providers of investor education programmes in developing more holistic programmes. Research limitation/Implication: Non-random sampling was employed in this study, albeit such an approach is consistent with the literature. Also, respondents comprised individual investors who are proficient in English because the researchers seek to complement Malaysian studies on the readability of English language financial statement narratives. KISHAN, K.; ALFAN, Ervina. Malaysian Individual Investors: What Are the Factors That Influence Their Financial Statement Usage?. Asian Journal of Accounting Perspectives, [S.l. ], v. 12, n. 1, p. 22-48, feb. 2019. ISSN 0128-0384. Available at: <https://ajap.um.edu.my/article/view/16887>. Date accessed: 20 apr. 2019.